Go- Getters living life, influencing the world, & following their dreams! We believe in the power of real people sharing their stories to influence and plant seeds of light and hope into others. We purposefully invite speakers who's journeys and lives reflect the courage it takes to follow big dreams. We seek out speakers who have the willingness, insight, and passion to honestly and openly share their stories and lessons of growth on the way to success. The goal of our Next Level Dreamers session is to provide inspiration, motivation, and support to attendees who are ready to live their own dreams! Erica and Erin are the definition of a magnetic, savvy combo on the rise. Exploring the Big Apple for their fourth year in a row, these sisters are set to continue garnering a buzz beyond belief. As New Orleans natives, Erica and Erin are rooted in southern culture, but have grown to embrace elements of the east coast, expanding their network and opportunities. You may have seen them in a national TJ Maxx campaign and will see them on more television networks and their up and coming video blog, "Twins in the City" on Youtube. Terri Staci Greenup, a native of New Orleans, is as well-connected as she is business savvy. With entrepreneurial experience since the age of nineteen, Terri’s vivacity, style and extensive Rolodex deem her a social savant in her own right. Terri’s resourceful nature has afforded her opportunities to successfully own and operate several businesses, including nightclubs, restaurants, a boutique and a real estate investment firm over the past 21 years. Her career background also includes branding, business development and security consulting. Terri is the author of "R U Being Played?" Relationship Pocket Guide, the creator of meshCHIPZ™ Collectible, interchangeable accessory for kids, the creator of Vision Book© "The Motivational Journal" and founder of F.R.E.A.K. vintage™ lifestyle brand. Many people may recognize Raelia from the hit TV show “America’s Next Top Model” that premiered in 2014. Raelia stole the hearts of many as she fought her hardest to win the competition. After the show, Raelia went on to open shows for New York Fashion week, Miami swim week, and LA style week. She has worked internationally in South Africa and South Korea. Raelia starred in two commercials and she is featured in over 10 publications worldwide. She has since added author to her resume with her inspiration book entitled Trust Your Journey which is an ode to dreamers. Cherri Gregg is an award winning journalist and the community affairs reporter for KYW Newsradio 1060. She reports on a variety of public affairs and social justice related issues, producing news reports, podcasts and other materials for KYW Radio, CBS-3 TV and CBSPhilly.com. Cherri is a rarity within the world of journalism-she is also a licensed attorney. She puts her law degree to work, providing analysis and extensive coverage on many highly publicized community legal issues. Cherri believes in living with passion and is frequently asked to moderate and speak on panels, MC events and give speeches on how to put one’s dreams into action. Rashauna Scott has worked the majority of her adulthood in corporate america and has successfully worked her way from associate and team member levels to managerial and supervisor levels. Now, as a full time entrepreneur she is able to now focus all of her talents and strengths on building her real estate empire. She believes that one of the main K.E.Y.s to success is to K.eep E.ducating Y.ourself! It is for this reason that she continually surrounds herself with mentors and experts within the 2 Industries that she's most passionate about: Financial Literacy and Real Estate. Her focus as a real estate investor is to build long-term wealth through the unique investing systems she utilizes. 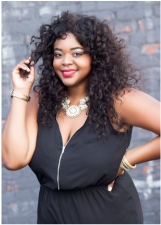 Rashauna is also a Mentor, Finance Coach, and Public Speaker. She pours her talents into schools and organizations with the goal to inform, educate, and share her knowledge to those who are diligent in learning more about business, financial literacy, and real estate. Taking a semester off from school, Chantel moved to New Orleans in 2000 where she connected with several athletes and charity organizations. Offering her assistance in one of the events, her talent and skill set became clear when she was asked to come on full time to work with the foundation where she would be shouldering a 9 city tour coordinating football camps, hospital visits, and readings to kids. After seeing the expressions on the children’s faces, for Chantel, her calling became clear, “I realized this was something I was suppose to be doing. I felt like I was helping these kids to feel better about themselves and helping them to be better also.” Naturally, she began to conduct her due diligence in the field, purchasing several books on charities and sports management. Wanting to become better informed of her new pursuit, Chantel studied feverishly to understand the nature of the business, and how she could make a heavier impact in it. And that she definitely did. After being recognized for her efforts during the 9 city tour, Chantel became in demand from several pro-athletes and organizations who hoped to have her work with their foundations as well. Interested in being a Speaker at one of our events? Let us know!